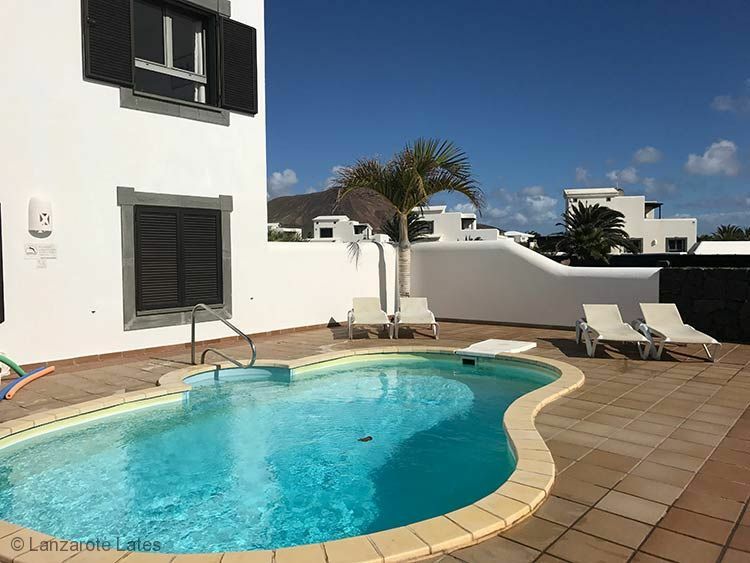 This fabulous villa in Faro Park, Playa Blanca is positioned well with fabulous sea, lighthouse and Fuerteventura views from the patio and the balcony areas. The villa has an off-road parking space and a small gated porch area leading to the front door. The large entrance hall has a table and mirror (so you can make sure you are looking your holiday best!). On the table is a full information pack and tourist information, designed to help you make the most of your holiday. The stairs off the hallway lead to the master suite, which we'll come back to later. There are six comfortable sun loungers surrounding the electrically heated kidney shaped private pool which has a hand rail for easy access. Around the side of the property there is another outdoor eating area with a large table and seating for eight, this is covered over and well-lit. Doors off this area lead to the utilty room with washing machine, tumble drier, iron and ironing board and the kitchen area. In the fully equipped kitchen you will find a dishwasher - no washing up on hols! There's a fridge freezer, microwave, kettle, toaster and cooker here, but if you don't feel like cooking indoors you can use the BBQ! Back to the hallway, there are three doors leading to the following - family bathroom with walk-in shower and hairdryer, two twin bedrooms with double wardrobes and windows to the pool area. Upstairs the master suite is huge with a good quality double bed, windows with sea views, and an ensuite bathroom. Double wardrobe with security safe and patio doors out to the impressive balcony area which has another table and chairs. 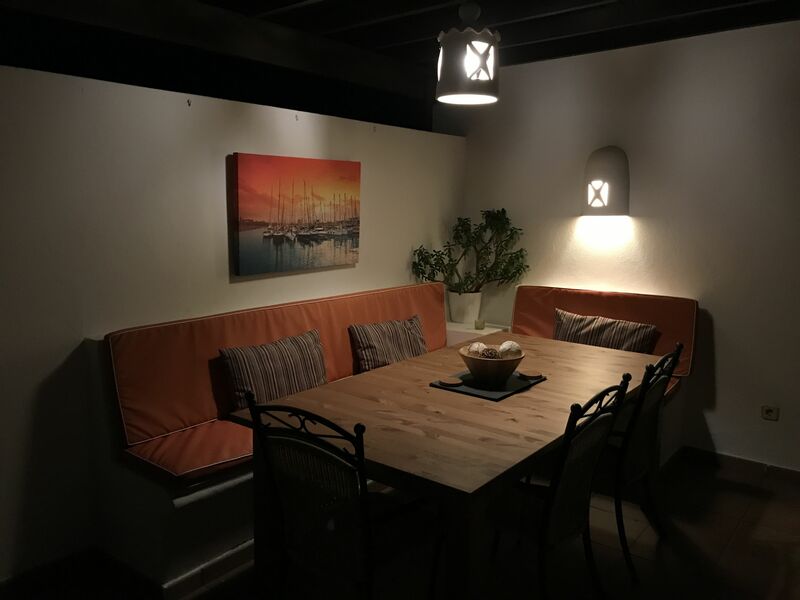 You'll want to spend lots of time up here taking in the sea views and watching the sun go down with a glass of wine! Faro is Spanish for Lighthouse and as its name implies that is just where Faro Park is. Adjacent to the lighthouse and on the southern most tip of Playa Blanca. 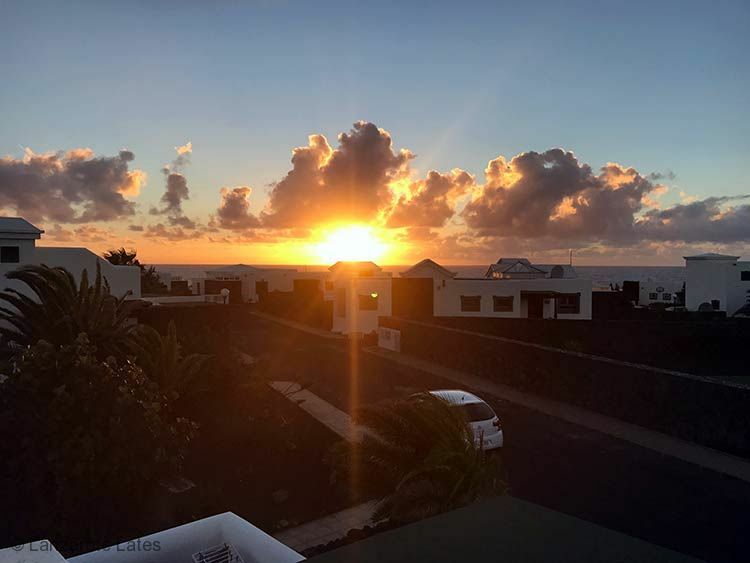 Although a 7minute drive, or 1hour 20minutes walk out of Playa Blanca, Faro Park has its own charm The villas are located either side of a quiet road, and in well kept mature gardens, the surrounding area is one of natural beauty. Faro Park is served by the local regular, reliable bus route, and for a euro or so, you can reach the village or venture further around the island. A taxi ride would cost around 3e to reach the village. Some holidaymakers drive out, park in the village and then get a taxi back after sampling the local vino! A head-clearing walk the next morning along the beachfront promenade to collect the car is a relaxing start to the day! As there is an array of shops, bars and restaurants actually in Faro Park, you don’t have to venture out until you want to. Within walking distance from any of the Faro Park Villas, you will find a commercial promenade. There is a wide selection of places to eat and drink in, or take away. These include 4 English bars, a Spanish bar, a Chinese restaurant, and an English owned café where the baker cooks overnight a mouth-watering array of delights to sell the next morning. There are 2 supermarkets, the bigger one of the two stocks nearly all that you need, apart from fresh meat and fish, although both are available frozen. As there is quite a community of English residents/villa owners in Faro Park, the shop sells some English produce too. No need to miss out on your English breakfasts though, either buy your ingredients there, or let one of the restaurants cook a full English Breakfast up for around 3.50e. One of the beauties of Faro Park is the proximity to the sea, with the super promenade meandering along the sea front, all the way along to the new Marina. Although it would take some time to walk it, why not hire a bike and admire the view along the coastal path. There are lots of lovely places to stop and take shade from the sun whilst you gather your thoughts and refresh your senses. 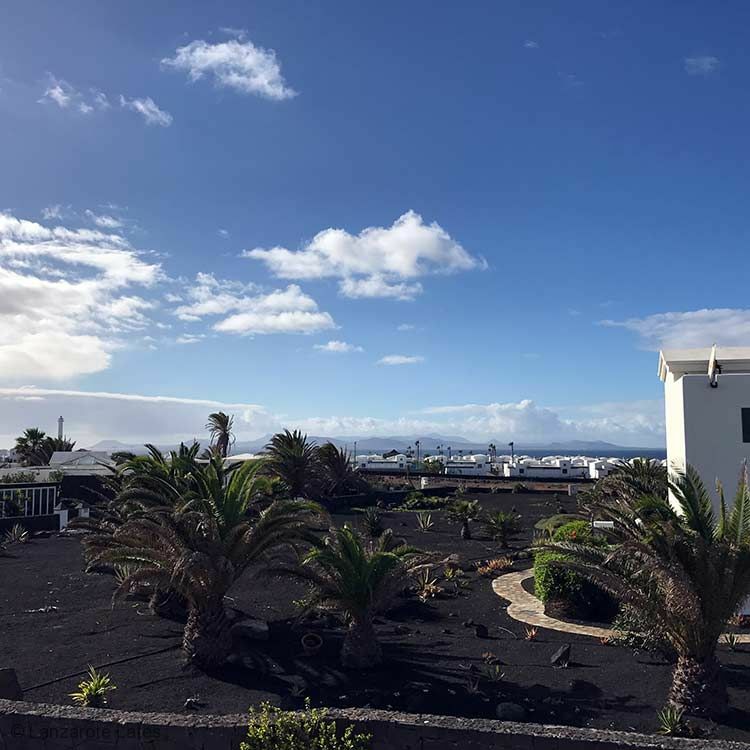 Many of the Faro Park villas have incredible sea views, across to Bocaina straights to Fuerteventura. Regularly you will see ferries, cargo ships, fishing boats and occasionally cruise ships going by. It’s a fantastic place to base your holiday, and although the rock pools and southern tip of the island waves are fantastic to watch, especially when the sun sets, it is strongly recommended not to venture on to the rocks or attempt to swim. The lighthouse is interesting to look at and again a perfect venue to watch the sunset. Do not be tempted to venture into the sea. The tide and waves can be dangerous. Only a short drive away is some of the wonders of Lanzarote, The Timanfya Mountains, and Papagayo Beaches. The villages of Femes, El Golfo and Las Brenas, all with their own delights. Probably the best villa position in Playa Blanca. villa was clean and tidy on arrival. Lovely villa, very spacious and comfortable. Heated pool is wonderful. Perfect stay! Everything for a pleasant stay was in the villa. Very quiet surroundings. We loved the view from the roof terrace.